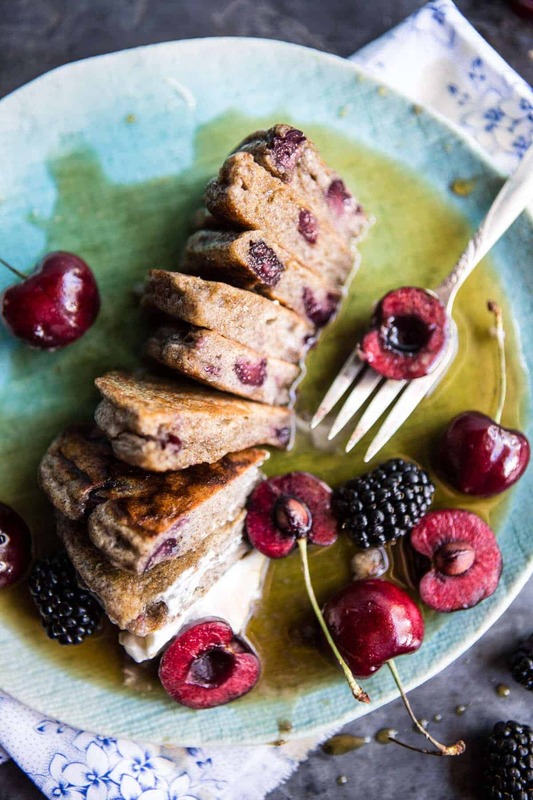 You all know about my love for all things breakfast and brunch, so you had to have an idea that something like this giant stack of Sweet Cherry Buckwheat Pancakes might be on the way. I mean, with all the summer berries and produce?? YES, it just had to happen! Also, you guyyyssss, HAPPY FREAKING FRIDAY! I have to say, I am so ready for the weekend. It’s been a long, busy, tiring… but awesome week! Three pretty big photos shoots took place that all went really well. I am excited to share each with you guys…one you will find all about next week. HINT: it’s all about summer entertaining! The rest are going to be a bit of a longer wait, but promise when I do finally get to share them with you, it’ll be so fun, and worth the wait. So basically I’m just building up the anticipation here. Anyway, the point is, I’m pretty happy it’s Friday. I have zero plans, other than cooking, which I am excited to dive into. OH, and I am determined to get in a snapchat recipe either today or tomorrow so stay tuned (username: hbharvest). OH OH! And obviously I’m making batch after batch of these pancakes, because clearly they’re what summer breakfasts are all about. Here’s the deal. I’m a freak for cherries, so creating a cherry pancake was a must for me. For some reason the sound of cherries, bourbon and bacon really sounded super appealing to me so I just went for it. Ummmm, yes, it’s an amazing combo and one that I am SOO glad I tried. The pancakes are actually buckwheat pancakes, which I think goes really nicely with the sweet cherries and savory bacon. Not sure why, but it just really, REALLY works. That said, if you’re not a fan of buckwheat, or simply don’t have buckwheat flour on hand, you can sub in whole wheat flour or just more all-purpose flour. 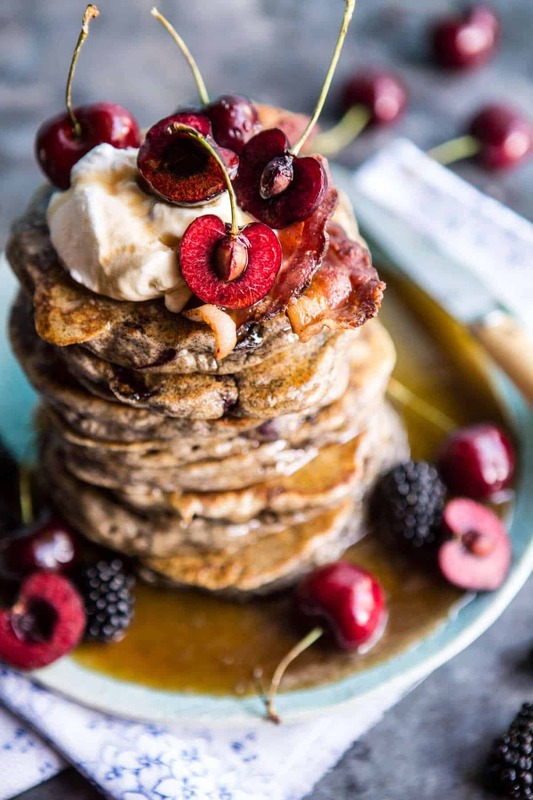 Either way…as long as you have cherries, bacon, and maple…these pancakes are going to be EPIC. OK, and I guess if you don’t eat bacon it can definitely be omitted, but I do have to say, the bacon adds something a little special to this stack. And that’s coming from a girl who’s really not all that into bacon. I know, I know, what?!? I only like it for certain things, and one of those things is most definitely these pancakes. The saltiness in the bacon pairs so flipping well with the sweet cherries and bourbon syrup. And then just like that, my weekend plans are set in stone. Cooking, chilling out, probably folding some laundry, catching up on my overloaded inbox, and eating ALL the sweet cherry pancakes with bourbon syrup and bacon I can handle. 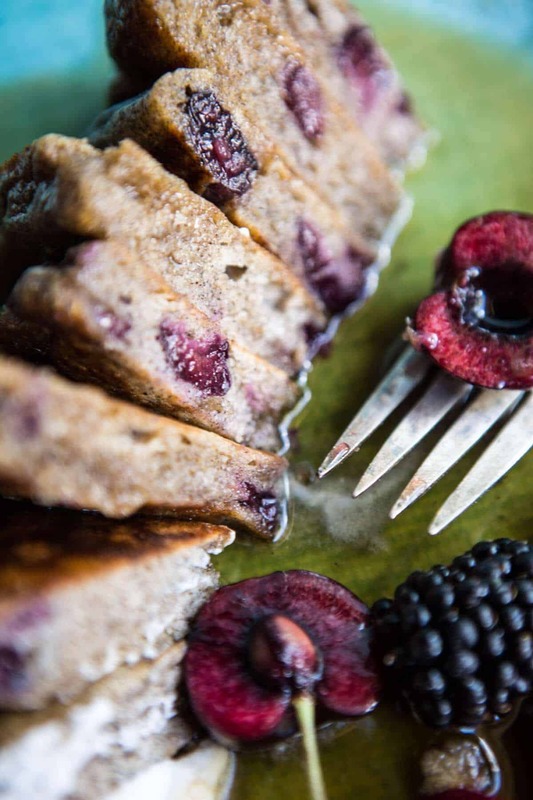 It's about time for some summer pancakes. 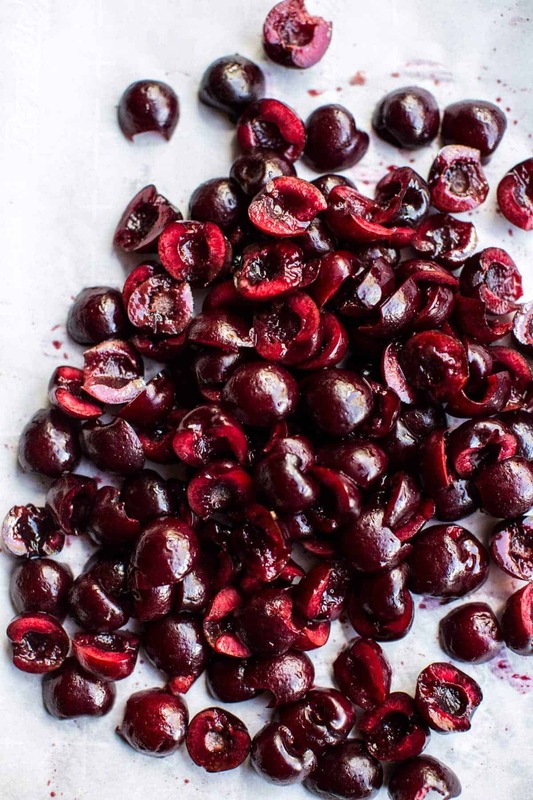 On the baking sheet, toss together the cherries, butter and bourbon (if using). Place in the oven and bake for 20-25 minutes or until the cherries have broken down and caramelized. Remove from the oven. Meanwhile, in a medium mixing bowl, combine the flour, buckwheat flour, baking powder and salt. 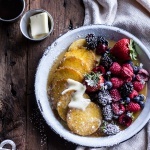 Add the buttermilk, eggs and vanilla and mix until just combined, making sure not to overmix the batter, a lumpy pancake batter is a good pancake batter! 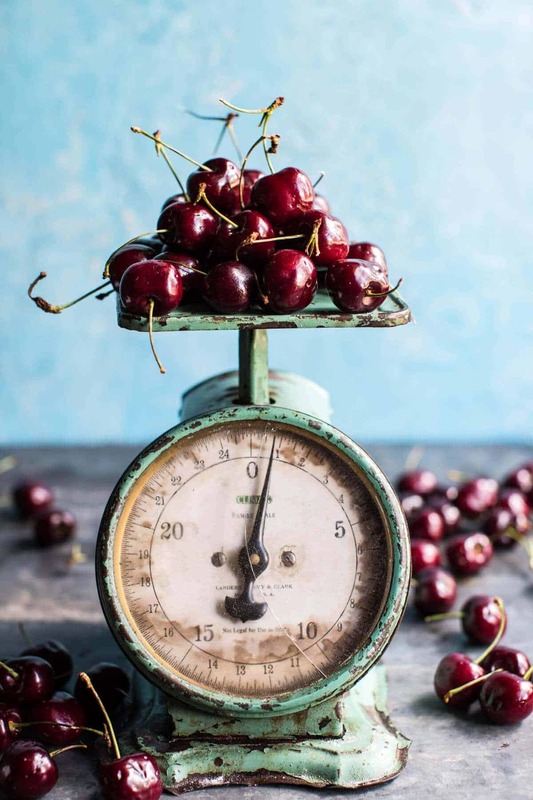 Once the cherries are done roasting, gently fold the cherries, along with any juices left on the pan, into the batter. Again, do not overmix or you will end up with pink pancakes. Let the batter sit on the counter for 5-10 minutes. In a small sauce pan, combine the maple syrup, bourbon and butter. Bring to a boil and boil for 2 minutes. Remove from the heat and keep warm for serving. Heat a skillet on medium heat. Grease with butter or cooking spray. Pour about 1/4 cup pancake batter on the center of the hot pan. Cook until bubbles appear on the surface. Using a spatula, gently flip the pancake over and cook the other side for a minute, or until golden. Repeat with the remaining batter. 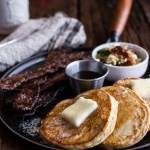 Serve the pancakes topped with crispy bacon, whipped cream, and a generous amount of the bourbon maple syrup. EAT!! 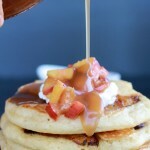 Best pancake stack of summer… for real. This looks so amazing haha. Pancakes are probably my favorite food ever. I’ve also never tried buckwheat! Definitely an adventure I’m willing to partake in! Thanks Jessica, I hope you love them!! I will pass on the bourbon. My two year old granddaughter and I are not a big fan. Thanks and have a relaxing and well deserved weekend! Well since you are making batch after batch. . .than you probably wouldn’t notice you had an extra person at the brekky table. What time should I show up? 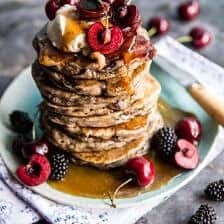 😉 These look fantastic. . .and since I am a cherry freak as well. . .please make my stack a double wide. Hey Lynn!! haha! See you in the morning! lol! Thanks so much and have a great weekend! Wow, these look amazing! 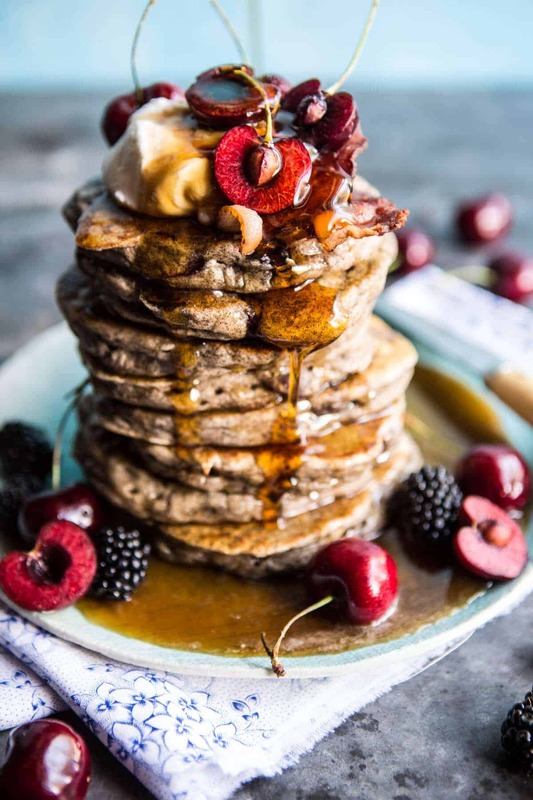 I am not usually a big fan of pancakes, since eating them usually means I have to beach myself on the couch for the rest of the day, but these are BEAUTIFUL and I will definitely be making them. Thanks so much Kate!! I hope this turn out awesome for you!! Yes, we NEED the buckwheat. What could go better with the sweet cherries?! 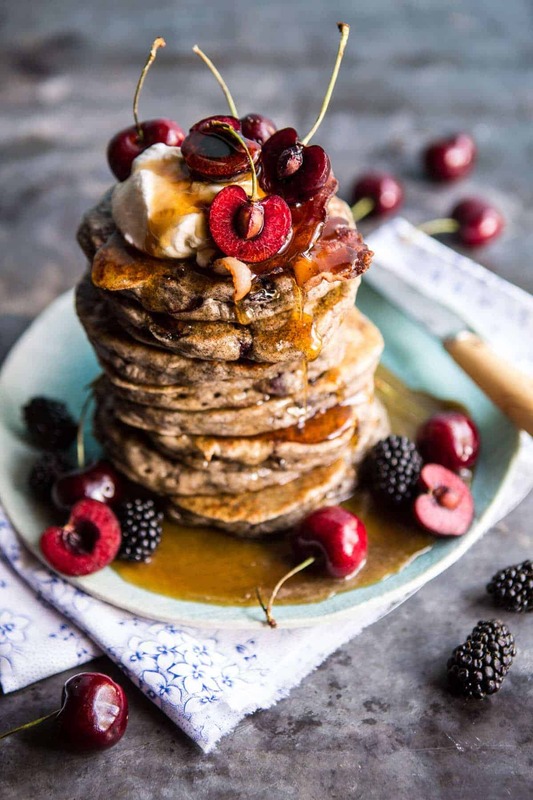 I absolutely love this stack of gorgeous pancakes! So colorful and beautiful! would have never thought to pair cherry and bacon together, but now that you have (thanks for being a genius! ), i can’t get that sweet/salty combo out of my mind. Awh thanks so much Heather! That is so awesome, I hope you enjoy these! I like your pancake recipe because I like buckwheat and the bacon. Thanks Nancy! Hope you enjoy these!! 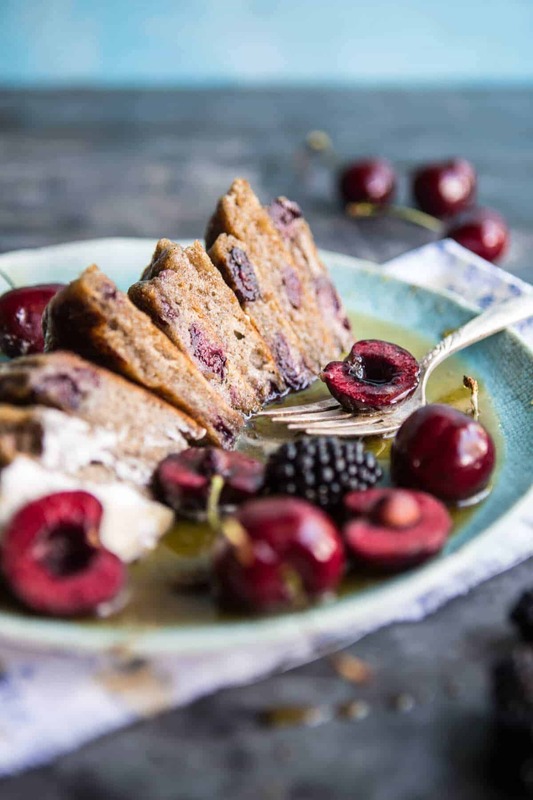 You had me at sweet cherry buckwheat pancakes…but throw in the bourbon butter syrup and bacon!! Now it’s a party!! Haha! Thanks Mick! I hope you love these! ? Simply beautiful! I mean those photos are stunning. 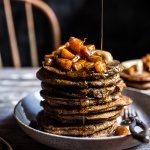 These look amazing, I definitely need to go buy some buckwheat flour! Oh my gosh everything about this is just so perfect. I don’t really eat pork but maybe I can find an alternative because I don’t want to miss out on that saltiness! Well I hope you enjoy these haha! Thanks Amanda!! ? Two things I’ll definitely use here…bourbon and bacon. I can’t wait to see how the flavors come together. Awh great! Thanks so much Renee, I hope these turn out awesome for you! ? Now that is pure deliciousness in perfection. My mouth is watering, too bad I can’t just reach in my computer and grab this goodness. I will be making this very soon. LOL! Thats so awesome to hear! I hoep you enjoy these, thanks so much Celeste! 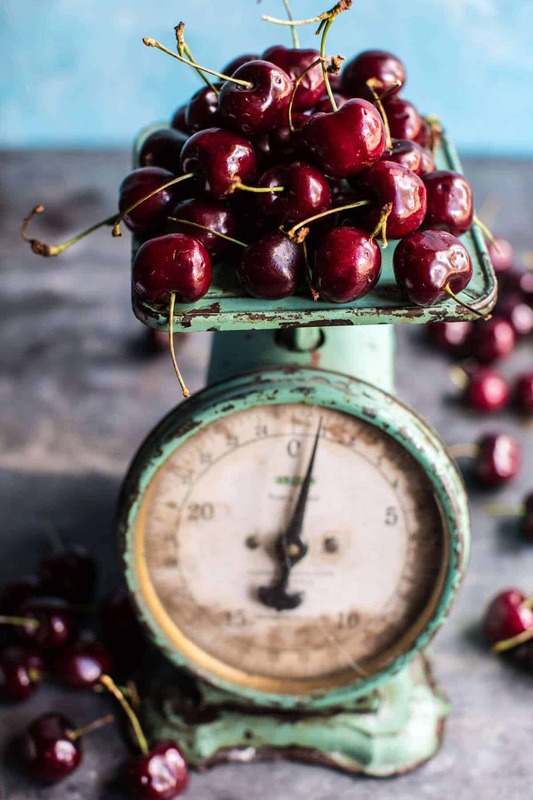 All of those cherries look amazing! Haha! Thats what I’m talking about! i love when you guys get excited about my recipes!! Thanks so much MAK, I hope you enjoy these! Oh man, I literally just ate cereal for breakfast and now that I’ve seen these I am regretting my breakfast choices…I’ll be making these tomorrow! Haha! Thats awesome! I hope you enjoy these tomorrow morning! Thanks so much Hannah! I love to cook sweets, and your recipes are the best I’ve seen. I am delighted. Greetings from Russia.